Read on to discover all you need to know about buying your first slow cooker. When it comes to slow cooker shopping the first thing you have to decide is whether or not you are actually going to use one. There’s no point buying a family size 6 litre slow cooker that will take up loads of space if you’re only going to use it once a year. So lets start at the very beginning. Why should you buy a slow cooker at all? When you’re in a job that involves working long hours you have a couple of options: the first is to give up on food and live off snacks, ready meals and coffee. This was never going to be an option for me. Alternatively, you can stick to quick and simple recipes that involve little effort – think omelettes and stir fries. Not a bad idea but sometimes you want something a little more exciting. Your third and final option is to buy a slow cooker – a clever machine that cooks your dinner for you while you are out at work. That’s right…slow cookers cook your dinner for you. They take away all the stress of standing over the stove juggling multiple pots and pans which means they are not only useful for people working long hours like me, but for families looking to lighten their load, those less able to stand in the kitchen cooking for long amounts of time and anyone else who just wants to save time. We are also big fans of healthy eating, with as many meals as possible being cooked from scratch slow cookers make healthy eating even easier with many recipes requiring little to no added fat. Now I’ve convinced you that you need a slow cooker lets look at buying one. There’s an awful lot of literature out there on what you should look for when buying a slow cooker, the best type of slow cooker and what size slow cooker you might need. So I’ve done the hard work for you and tried to sum it up in my top 10 tips for buying a slow cooker. 1. 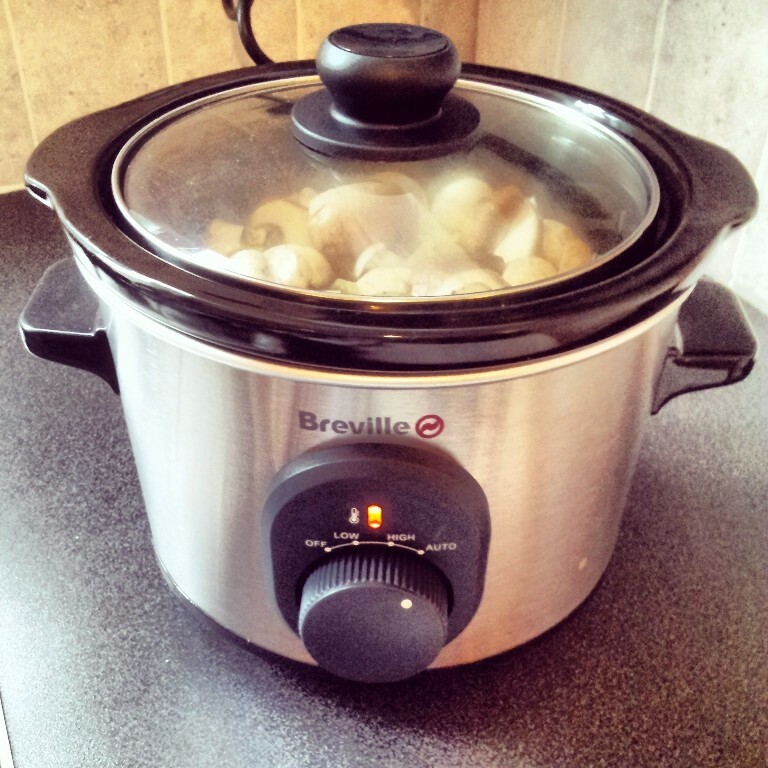 Slow cooker v Pressure cooker – which do I want? This is perhaps one of the most asked questions when I speak to people about slow cookers. It seems a lot of people get the two confused. A slow cooker is ideal for anyone looking to have dinner cooking away slowly while they are out at work for the day. It is great for cooking mince dishes, curries, stews and soups without any hard work from you! You can also make cake and cocktails in a slow cooker! A pressure cooker on the other hand cooks food extremely quickly. A recipe that might take an hour will only take minutes so it’s fab for anyone looking to speed up the cooking process rather than slow it down. However, because it uses such high heat it is not ideal for delicate ingredients such as fish and some vegetables. If you’re after the slower, lazier option then read on! When buying a slow cooker size really does matter. Although it can be stored away when you are not using it, if the slow cooker becomes your new best friend you don’t want something huge that will take up a lot of space on your kitchen counter, especially if you are only cooking for two. On the other hand if you are intending to use your slow cooker to feed a hungry family and to entertain, you want to ensure you slow cooker is large enough. You might want to consider buying a larger slow cooker than you need if you like to batch cook, freezing the extras. As a two person household we went for the smaller 1.5 litre model and we haven’t been disappointed. There are no wasted leftovers and we don’t end up eating unhealthily large portions – win win. As well as deciding on the size you may want to give some thought to which shape your slow cooker might be. The circle shaped slow cookers are perfect for soups and stews but an oval shaped slow cooker is an essential if you intend to cook large cuts of meat. A 3.5l oval slow cooker is the smallest you should consider for cooking a whole chicken for example. A leg of lamb would fit more comfortably in a 6.5 litre slow cooker. Note that often the smaller slow cookers for 1 or 2 people are circular in shape. Slow cooking is a cheap way of cooking if you pick the right cuts of meat and vegetables. However, leaving an appliance on all day can be expensive. When looking for a slow cooker consider whether you are more concerned about the cookers power or your electricity bills. The higher the number of watts, the more effective the slow cooker will be especially on its highest setting. But if you want low, slow, cheap cooking a low wattage may be for you. 5. Do I need a timer? A timer is not a necessity when buying a slow cooker. Many slow cookers will switch to the “heat” setting once the cooking time is up, so if you are later in for work then planned it will continue to keep your dinner warm for you. However a timer is a fantastic feature if you only want something to cook for a few hours rather than all day. 6. What is a “cool wall” model and do I need one? When we were looking for slow cookers we saw hundreds of product descriptions and reviews that used the term “cool wall”. It baffled us to begin with but now all is made clear. A cool wall slow cooker is one that does not let the heat escape out of the sides. Cool wall is much safer if you have children about that may be tempted to touch the slow cooker and is also much more efficient! So it’s also something to consider if you want to keep your electricity bills low. Appliances with removable parts can be tricky – and I should know, I have a Kenwood that has a million and one different removable and detachable parts. BUT bear in mind that a slow cooker with removable parts will be much easier to clean, saving you even more time in the kitchen! Often when we are trying something new we are tempted to go for a brand name we can trust and many of you will heard of brands such as Breville, Crock-Pot and Morphy Richards who all offer a wide range of slow cookers. However, if you are trying slow cooking for the first time why not try a slow cooker from a lesser known brand or perhaps a supermarket range or even Lakelands own? You will be able to get a much better deal for your money if you decide to look outside of the big name brands. Something else we found when searching was that there were a number of different heat functions. The most basic of all slow cookers we found (Argos own range) only had “high”. This is fine if you aren’t looking to cook your dish for more than 4 or 5 hours. For slower cooking a “low” setting is essential. Most of the bottom range of slow cookers will have both high and low. For most people this is all you will need. If you are willing to spend a little more money you may also find your machine has a heat setting or an auto setting. These are slightly different though on some website I’ve found the terms interchangeable. For the most part the heat setting should be used to keep food warm once it is cooked through (ideal if members of the family are getting in at different times). The auto function however will change the temperature at which the slow cooker cooks all by itself. Usually on auto the slow cooker will start high and the move to a low heat for the remainder of the cooking time. 10. Gather slow cooker recipes! Although slow cookers can be picked up incredibly cheaply these days the best way to decide what kind of slow cooker you need (if one at all) is to start thinking about the kind of recipes you might be cooking on a day to day basis. Tagines, curries, pasta sauces, soups, stews, casseroles, roast meat and more can be cooked in the slow cooker. For some cuts of meat this will change the shape of slow cooker you might want. Why not follow my Slow Cooker Recipe Board on Pinterest for more inspiration? Follow Emma’s board Recipes – for Slow Cookers on Pinterest. Hopefully once you’ve researched all of the wonderful things you could be eating you will go out and buy a slow cooker straight away! Good luck with your search and do let me know if you choose to buy a slow cooker. Please also feel free to share any other tips you have when buying a slow cooker in the comments below. I look forward to reading them! Thanks. Really helpful although still can’t decide which brand to choose. Thanks Heather. I think to be honest all the brands are much of a muchness. I know people who have supermarket range slow cookers up to really fancy well known brands and they don’t vary that much. It’s more function and size that’s important 🙂 hope that helps! I have some more up my sleeve for 2016! I’m new to all this – I have a SC with Low High and Auto functions – but no timer. If a recipe is 4 hours on high or 8 on low – what would it be for Auto ? Hi Shan I’d go for 6 hours on auto though if you do it longer your machine will just keep it warm rather than continue to cook it. Enjoy!